Listen to samples of our ensembles! Interested in having us perform for your wedding? Visit us on Facebook for recent photos, videos & news! Trios are surely our most popular bookings. With high, mid and low parts covered, the sound is nearly as rich & full as a quartet without the cost of hiring an additional player. While these are dubbed as our "Classical Trios", don't let the name fool you! We perform music from just about any genre out there & are happy to learn your unique requests. Like the sound of our "Flute-Violin-Cello Trio"? Visit Trillogie Trio on their personal website for more samples! With a lighter and airier sound than the Trios, our Classical Duos are sure to please. Whether you choose the bright sounds of the Flute & Cello, the elegance of the Violin & Piano, or the whimsy of the Flute & Harp, we will create arrangements of your music selections that you will love! Listen to samples of our various Duos below. Enjoying the Flute-Harp Duo? Check out our "Diamond Blue Duo" website for more! Simplicity is a beautiful thing! Keep the sound clear and pure with one of our talented soloists. 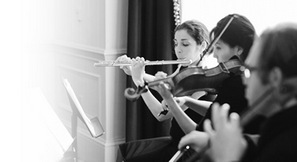 Violin, Cello, Harp and Piano are among our clients' favorites! Perhaps you're throwing a backyard party for your sons graduation, daughter's engagement, baby's christening or parents' 50th anniversary... or maybe you're planning the soundtrack for your wedding cocktail hour or arranging entertainment for a corporate event? Whatever event you are dreaming up, we've got some great teams of Jazz, Swing, Bossa Nova, Gyspy Jazz and Bluegrass musicians who are excited to play for you! Saxophone, Fugelhorn, Trumpet, Violin and Vocals.